Abstract: Objective To discuss 18F-FDG PET/CT diagnostic value and predictive analysis in adrenal metastasis lesions. Methods A total of 110 adrenal lesions in 95 non-symptom patients who underwent 18F-FDG PET/CT examination were retrospectively analyzed. Patients were divided into adrenal benign group(55 cases) and metastasis group(40 coses). Adrenal lesion size, CT attenuation value, SUVmax(standard uptake value maximum), and SUVmax ratio between adrenal and liver lesions(SUVmax ratio) were measured and recorded for each lesion. Univariate χ2 test, independent sample t-test, and Mann-Whitney U rank test were used for the statistical analyses. Univariate analysis and multivariate logistic analysis were used for the evaluation of predictive risk factor. 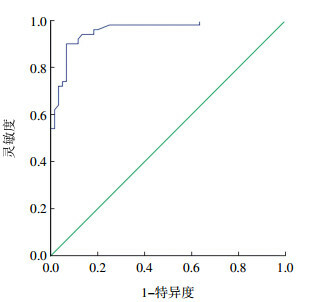 The author performed ROC(receiver operating characteristic) curve analysis to determine the cut-off value in the diagnosis of adrenal metastasis lesions. Results A total of 110 lesions, 60 benign and 50 metastasis, were detected. The lesions diameter was 0.65 cm~5.70 cm with the average diameter (1.65±0.82) cm; the lesions CT value were -20.4~46.8 HU with the average CT value(24.2±14.9) HU; the lesions SUVmax were 1.1~31.9 with the average SUVmax 4.5±4.6; the lesions SUVmax ratio were 0.44~14.5 with the average SUVmax ratio 1.99±2.15. Differences in size, CT attenuation value, SUVmax, and SUVmax ratio between the benign and adrenal metastasis lesions were statistically significant(Z=-4.908, -6.030, -7.966, -8.252, respectively; all P < 0.001). The SUVmax ratio was the independent risk factor of adrenal metastasis. The SUVmax ratio of 1.24 was the best cutoff in the ROC analysis, yielding a sensitivity of 90.0% and specificity of 93.3%. Conclusions 18F-FDG PET/CT is valuable in diagnosing adrenal metastasis lesions. The adrenal-to-liver SUVmax ratio is the independent risk factor of adrenal metastasis, and the SUVmax ratio of 1.24 was the best cutoff in the ROC analysis. Kumar R, Xiu Y, Yu JQ, et al. 18F-FDG PET in evaluation of adrenal lesions in patients with lung cancer[J]. J Nucl Med, 2004, 45(12): 2058–2062. 曲倩倩, 董印, 韩雪, 等. 扩散加权成像对肾上腺肿瘤的鉴别诊断价值[J]. 医学影像学杂志, 2015, 25(3): 492–495. Qu QQ, Dong Y, Han X, et al. The use of diffusion weighted imaging in the differential diagnosis of adrenal tumor[J]. J Med Imaging, 2015, 25(3): 492–495. Metser U, Miller E, Lerman H, et al. 18F-FDG PET/CT in the evaluation of adrenal masses[J]. J Nucl Med, 2006, 47(1): 32–37. Kim JY, Kim SH, Lee HJ, et al. 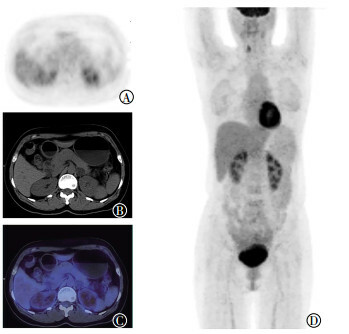 Utilisation of combined 18F-FDG PET/CT scan for differential diagnosis between benign and malignant adrenal enlargement[J/OL]. Br J Radiol, 2013, 86(1028): 20130190[2018-04-01]. https: //www. birpublications. org/doi/pdf/10. 1259/bjr. 20130190. DOI: 10.1259/bjr.20130190. Launay N, Silvera S, Tenenbaum F, et al. 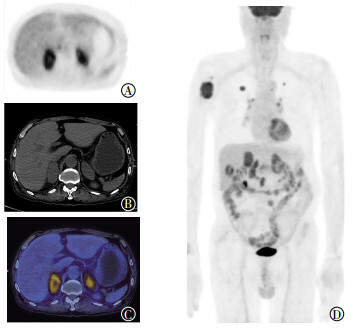 Value of 18-F-FDG PET/CT and CT in the Diagnosis of Indeterminate Adrenal Masses[J/OL]. Int J Endocrinol, 2015, 2015: 213875[2018-04-01]. https: //www. ncbi. nlm. nih. gov/pmc/articles/PMC4333271/pdf/IJE2015-213875. pdf. DOI: 10.1155/2015/213875.